We have been focusing on acts of kindness this year as a family. I really want my children to make kindness a habit so we have been focusing on what acts of kindness are. They can be big huge gestures or simple kindness acts that make a difference in someone’s day. 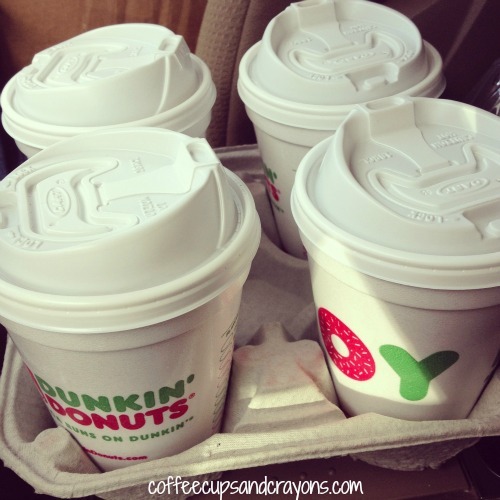 One easy act of kindness is buying coffee for someone. This has to be one of our family’s favorite acts of kindness ideas! It can be as simple as paying for the person behind you in line at Starbucks (the baristas LOVE when people do this!) or bringing a cup of coffee to a friend who is having a rough day. At Christmastime this was a hit with the kids! We would drive through and buy a $5 gift card to give to the car behind us when they pulled up to pay. The kids would bring change they had collected to put in the tip jar for a double act of kindness! We also love to buy coffee (or tea) for our teachers. It’s a simple and easy way to show them that we appreciate what they are doing any day of the year! The past couple of weeks have been crazy at our house–for 18 straight days at least one of the kids was very sick. We were in and out of doctor offices and urgent care centers and it was totally exhausting. During this time I was very fortunate to get to be on the receiving end of acts of kindness from so many of my friends and neighbors. I love coffee and definitely needed some extra energy and so many kind people bought me coffee and gave me coffee gift cards. 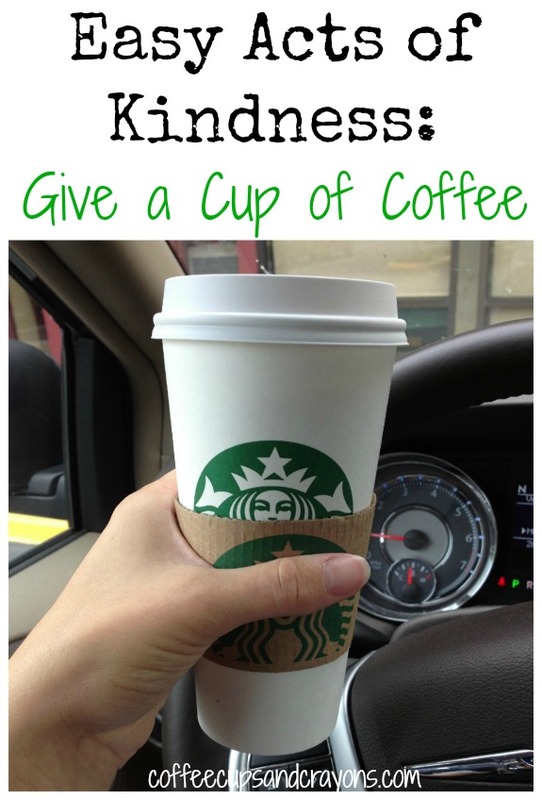 I can tell you from personal experience that giving coffee to someone is a wonderful act of kindness! 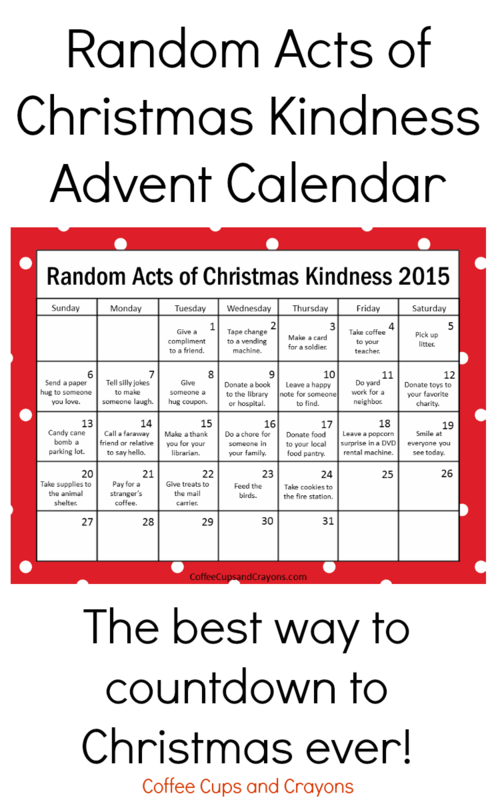 Want to join in and count down to Christmas with 24 Random Acts of Christmas Kindness? Click here! Oh we’ve bought coffee for the person behind us in the starbucks drive thru and you are right! The smile on the barista’s face is worth it 🙂 Nice work Momma. I think it teaches the kiddos something too. The last time I did it my step-daughter was with me and she asked why I did that. We had a nice conversation about kindness towards others after. I absolutely love your post! Small, simple gestures of kindness really do make all of the difference. Several months ago, my daughters and I were at the drive-thru Starbucks and when we got to the window to pay, the barista said that the person in the car ahead of us had already paid for us. We were all — and still are — so touched and moved by this stranger’s act of kindness. Because it was the drive-thru, the person who paid had driven away before we got to the window, so we never even got the chance to thank him or her. This kind stranger didn’t even get the satisfaction of experiencing our appreciation and gratitude. Thank you, Megan, for writing this post. You are truly making the world a brighter, happier place by instilling these wonderful values in your children. Hope you and your family had a fabulous Thanksgiving holiday! Katherine thank you so much!!! 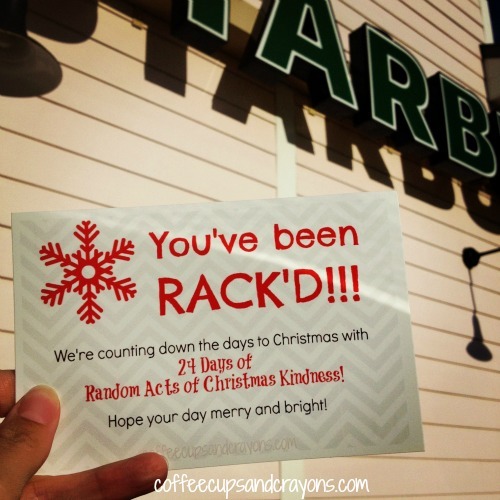 Doing a random act of kindness at Starbucks is so much fun because the baristas get so excited! I’m so glad you were able to receive one! Megan, I can’t find the calendar, Ive looked through your other responses but don’t see a link. I was so thrilled when I came across your great idea, because in our home, we do random acts of kindness during this time, but NEVER have enough ideas of what to do. We also do NOT do it for the full 24 days, so I can’t wait to download and get prepared. Thanks for sharing, and we appreciate YOUR kindness. I added the link to this post for you! I’m so excited to have you join in!